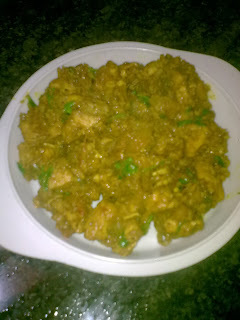 This is a dry chicken recipe - sukka meaning dry,hence the name.The amount of chilly can be as per taste - this version is spicy and hot as we prefer it :) Chicken sukka can be served as a starter too..
Wash the chicken well and marinate it with salt,turmeric powder,red chilly powder and ginger-garlic paste for atleast 5-6 hours. Chop the onion,green chillies and tomato finely. Once onion sautes add the chopped tomatoes. Add salt and cover and cook for a minute. Put in the marinated chicken now. Add coriander cumin powder and garam masala. Cover and cook till the chicken is soft. Boneless chicken cooks faster and there is no need to add any water. Note - The chicken pieces shoud be small.If they are big,chop them.